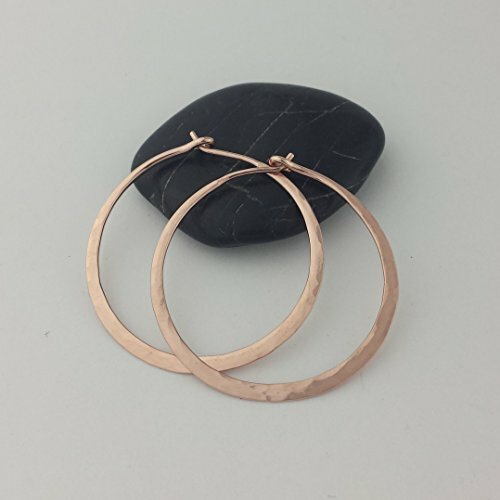 Gorgeous Solid 14k Rose Gold Hoops made from 16 gauge (1.3mm) wire. METAL: Solid 14k Rose Gold WIRE GAUGE/DIAMETER: 16 gauge (1.3mm) wire - Currently the thickest wire I offer EAR WIRE THICKNESS: Due to the thickness of the wire, the ear wire portion of the hoops will be tapered to approximately 18g, which is slightly thicker than standard ear wire thickness EARRING DIAMETER SIZE: 3/4", 1" , 1.25" (PICTURED), 1.5", 1.75" -OR- 2" diameter. Choose the size that is right for you! If you have any questions about this product by Aris Designs Jewelry, contact us by completing and submitting the form below. If you are looking for a specif part number, please include it with your message.